Beginning from Windows Vista, Windows OS comes with a free screen capture or screenshot utility, namely Snipping Tool. Thus if you own and use Windows Vista, Windows 7, Windows 8, Windows 8.1 and Windows 10, there is no longer a need to search for and download third-party freeware or paid screencap utility. And you can also forget about the tedious process to capture a screenshot by using Print Screen (Prt Scr) key and then paste the whole desktop or selected window into Paint or other photo editing software before cropping the image for the part you want. Delay of up to 5 seconds before a screenshot is captured (feature added in Windows 10). Cancel which enabled automatically once you start a capturing process. One of the most important improvement over basic Print Screen capture prior in Windows XP and older OS is that users can choose any portion or area of the screen to capture, including any open windows. Previously, it’s restricted to either entire screen or active window. To run snipping tool, simply click on Start button, then go to All Programs -> Accessories or All apps -> Windows Accessories, and click on Snipping Tool shortcut. To easily access and run Snipping Tool in Windows Vista or Windows 7, you can make the shortcut to launch Snipping Tool appear in Quick Launch toolbar (usually beside Start button). To do so, click on Options in Snipping Tool, and select (tick) Display icon in the Quick Launch toolbar setting. From Windows 8 onward, pin Snipping Tool to Start Menu/Screen or Taskbar for quick access. To start a new screen print capture, simply run Snipping Tool, it will automatically start in snipping mode. If not, or to capture again, click on New button on Snipping Tool toolbar or select File -> New Snip. While in capturing mode, drag the cursor, draw a line or select a window that you want to capture. Full screen capture will be automatically done. Once capturing is done, the Snipping Tool edit window will open and display the screen capture image. If you’re not satisfy with the result, simply click on New Snip button. You can also choose other options, such as Save Snip in JPEG, PNG, GIF or Single File HTML (MHT) format, Copy Snip to clipboard, Send Snip to email recipient, uses Pen which can be customized its thickness, color, chisel or round tip type to draw and mark on the snip, uses yellow Highlighter to highlight certain text or area, or uses Eraser to delete and remove away the Pen or Highlighter marking. All the command buttons on the toolbar in Snipping Tool edit window can be accessed from the drop-down menu bar too. In some Windows system, Snipping Tool is not installed by default. 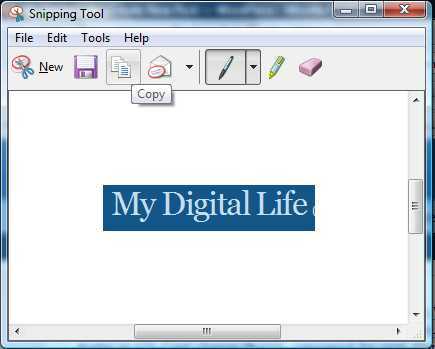 If you can’t find the Snipping Tool, follow the guide to add and install Snipping Tool. The snipped image will be saved with a colored border. You can easily set up the screen capture to be borderless.